Kitchen Design Think Tank: Bringing It All Back Home! Bringing It All Back Home! 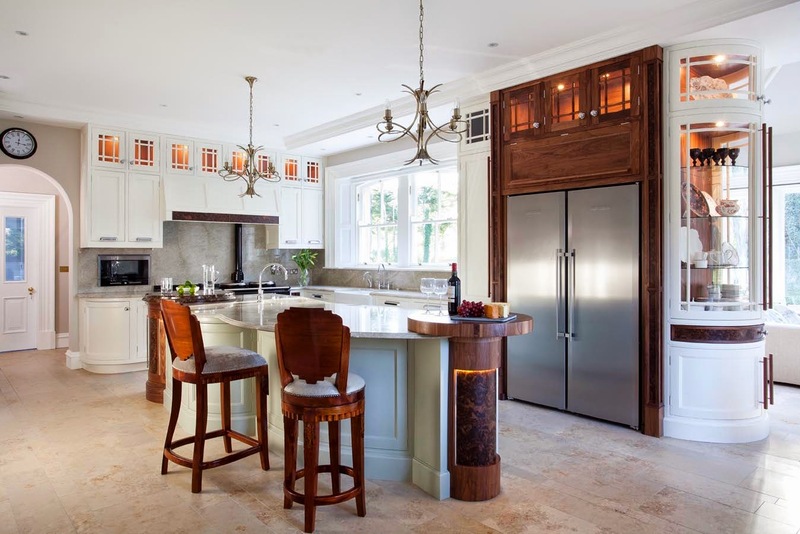 Contemporary kitchen design can be seen as clinical, exuding a subconscious masculinity and empowering the type of social status that is usually associated with owning a super car! It has even been argued that contemporary kitchen design has a commercial “look at me” attitude...a soulless presence! This design by Edwin Loxley claims to address the under valuation of artisan techniques by adding serious substance to contemporary style. There are a lot of things here that identify this design as being English! The clean clinical lines favoured in more Easterly locations have been softened and the geometry is very approachable, almost feminine! The materials also encourage the user to get tactile and explore the intricacy of the design. There is real craftsmanship here! Design longevity is encouraged because this kitchen does not fit snugly into the contemporary, mass produced box! There is a little soul in these veneers! The island is essentially made from two curves which flow into each other, imitating nature and presenting a wave like presence. Using layers, different materials and maximising the creases between the island waves adds visual interest, and factors in the essential elements of sociability and function. But the most striking element for The Mogul is the low level unit which shoots out from beneath a very mid-European looking island bridge! This tapered unit is fantastically semi clad in stone and it really does add an extra layer to the design! There is a real attempt here to soften the stereotype of contemporary kitchen design, making it more English, and more honest to the traditional techniques and materials used by cabinet makers! To be honest; The Mogul thinks that Loxley has managed to pull this one off superbly well! Some Rectangles Are Squares...and Kitchens! I'm Loaded! Oh yea baby! The Kitchen Wears The Trousers!